When the sun comes out and the concrete gets too hot, take your game to the pool with the Lifetime 1301 Portable Basketball Hoop. This hoop is specifically designed for poolside use and is built with durability in mind. Although the materials are not top of the line, they are good quality relative to other poolside hoops. All together, the stylish design and durable materials make this a good-looking poolside hoop that provides excellent value. The backboard is a 44-inch square made of polycarbonate. 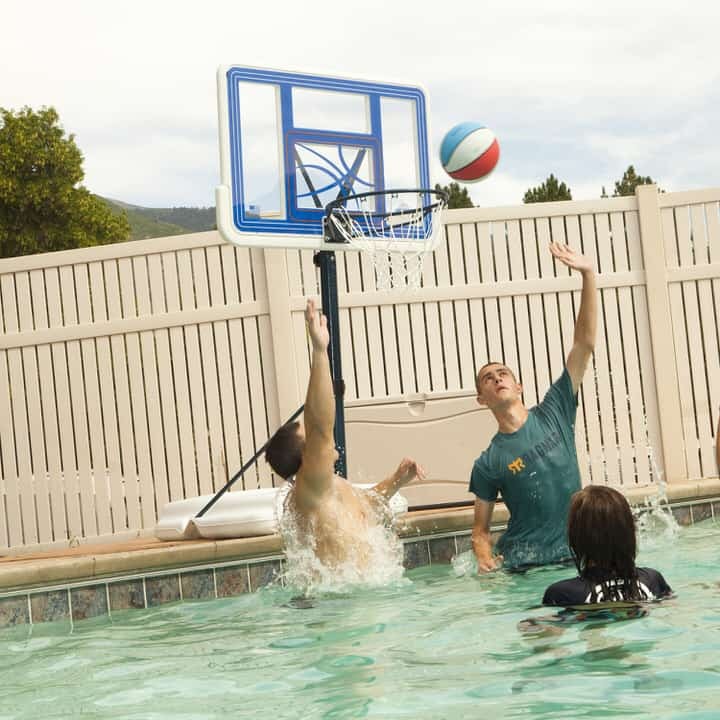 Many pool style hoops feature a fan style backboard, so the square backboard on the Lifetime 1301 is definitely preferable to many other pool hoops in its class. Of course, the polycarbonate board is not as responsive as glass, but it is extremely durable and shatterproof, which provides some piece of mind should the hoop ever fall over. The bottom edge of the board features a plastic guard for additional safety. Additionally, the backboard graphics are printed in fade resistant ink to keep the hoop looking fresh through years of weathering and use. This hoop comes equipped with a standard 18” rim. 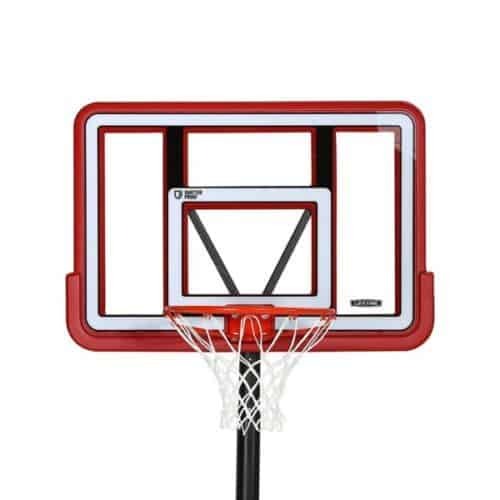 Even though the hoop itself is miniature (6.5 feet at max height) the rim is regulation size, meaning you can play pool basketball with a full- sized ball, or a miniature ball, if you choose. Just make sure you use a rubber ball in the pool, because a leather ball will become waterlogged, heavy, and could be ruined by the chlorinated water. Although it is not spring-loaded, the rim can withstand some light dunking, but hanging on the rim is not recommended. Some owners have reported that the hoop may begin to pitch forward after repeated dunking and hanging on the rim. Piecing together the Lifetime Pool Side Portable Hoop is doable for anyone with the time to focus, and of course, step-by-step instructions are included. The smaller size of this hoop makes assembly less cumbersome than a full-sized, 10 ft. portable hoop. Even so, an extra pair of hands is recommended to ensure safe and quick assembly. A good wrench is about the only tool required and assembly should not take more than two hours. Once the support pole, backboard, and rim are secured to the base, simply fill the basin with your choice of water or sand and wheel into place at your pool’s edge. From there, the telescoping pole may be raised or lowered to the appropriate height, depending on your preference and the depth of your pool. Warning: Because this hoop lives near water, the steel support pole and rim are prone to rust. Coating all metal pieces in clear spray paint before use is recommended to help prevent rust. 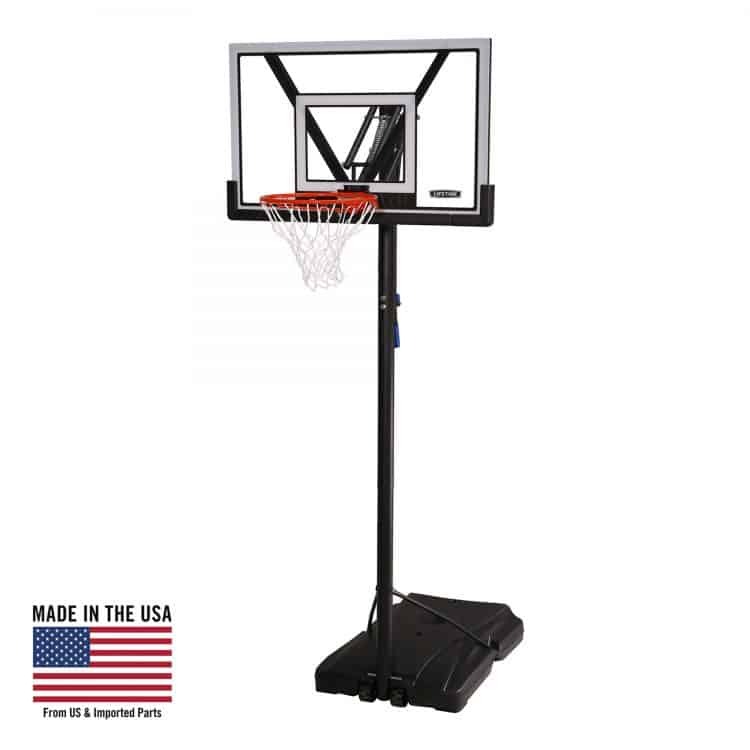 The Lifetime 1301 Pool Side Portable Basketball Hoop utilizes a 3” diameter telescoping steel pole that can be adjusted from 4 feet to 6.5 feet, in 6-inch increments. Basically, that means there are two poles, one inside the other, that slide up and down, like a telescope. Simply loosen the screw on the outside of the support pole, move the pole up or down to your desired height, and then retighten the screw. Although the mechanism is rudimentary, the hoop is easy enough to adjust by hand, with no tools required. And, because the hoop will probably spend most of its time in one location, pool side, at one height, you will not need to constantly adjust the height. The Lifetime 1301 Pool Side Hoop is an excellent option for pool owners who want to bring a little extra fun and competition to their backyard. Obviously, this hoop is not suited as a primary basketball hoop, but it was not designed to be. As a secondary hoop for playing basketball in your pool hot days, this hoop is a great option. Back in the day most recreational basketball hoops were mounted to the garage. Nowadays it is hard to even find a hoop for sale that can be mounted in this way. Thankfully Lifetime makes the Lifetime 73650 backboard and rim combo kit for those who still prefer a wall mounted hoop. The Lifetime 73650 is also perfect for those who are on a tight budget. At under one hundred dollars, this is a great choice for any family who simply wants to experience the game of basketball in the convenience of their own home. The backboard on the Lifetime 71650 is 44 inches and made from a combination of both acrylic and polycarbonate components. There certainly is some vibration with this backboard due to its cheaper materials, but gets the job done if you just want to shoot baskets. The rim is pretty nice considering the affordable price point of the Lifetime 73650. It comes with two exposed springs to offer some protection from dunks. Although the spring is helpful we do not recommend dunking on this basketball hoop as it is not designed to take heavy punishment. One downside to the Lifetime 73650 is that it does not come with a mounting bracket. If you need a mounting bracket you will need to buy on separately, which can be found here. While we know not including the mounting bracket makes the hoop cheaper, we feel that Lifetime should just include this piece as it is important for most people who buy this hoop. Every Lifetime basketball hoop is made in the USA, which offers an extra “feel good” bonus to your purchase. Lifetime is a great company and they make solid products all around. You can see more of our Lifetime basketball hoop reviews here. For those who want a hoop to mount to their garage or another wall without spending a fortune, then the Lifetime 73650 is for you. While it is not perfect, it is priced right and works very well for families and others just looking to shoot some hoops. 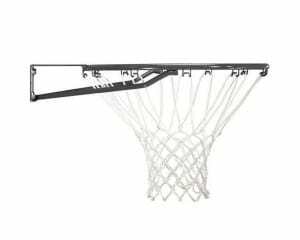 If you would like to check out another wall mount basketball hoop then we recommend checking out the Spalding 54-Inch Backboard and Rim Combo. Being that I review basketballs, basketball hoops, and other basketball-related products for a living it goes without saying that I take the game seriously. So, when it was time for me to pick up a basketball hoop for my home you can bet I did a fair amount of research. At the end of the day I ended up buying the Spalding Hybrid Portable Basketball Hoop. 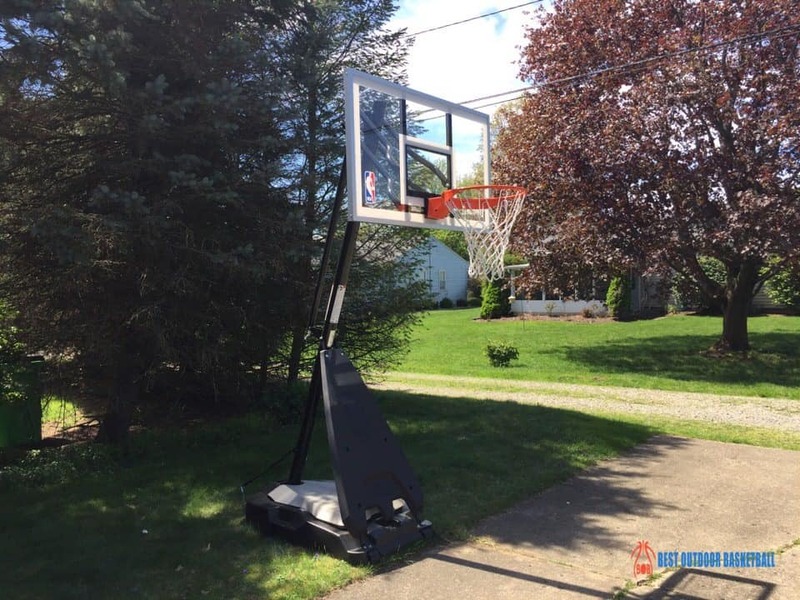 In this review I am going to give you insights on why I picked the Spalding Hybrid Portable Basketball Hoop, tips for installation, and my commentary on how this basketball system performs. Why The Spalding Hybrid Portable Basketball System? Given that I review and research basketball hoops regularly it is fair to ask why I went with this hoop. Going into the buying process I knew I wanted a portable basketball hoop. That alone eliminated all the in-ground basketball hoops that are available for sale. Next was deciding which portable basketball hoop was right for me and my needs. I went about checking out some portable basketball hoops at the local sports store and at the end of the day it came down to either the Silverback NXT and the Spalding Hybrid. I went with the Spalding because the reviews of those who purchased were exceedingly positive (except for one purchaser), and the Spalding Hybrid has more bulk and heavy-duty features when compared to the NXT. Lastly, I like the idea of the hybrid base. While it may seem like a gimmick at first, I’ve read many stories of hoop owners who have bases that have leaked over time basically making the hoop useless. With the hybrid base I can always add as much sand as I need even if a leak develops in the future. I received my Spalding Hybrid Basketball Hoop via home delivery and the guys delivering were nice enough to place the hoop in my garage so that I could begin the assembly process. When I initially pulled out all the parts and materials I was a bit overwhelmed. Admittedly, I am not the most handy individual, but have improved over the last few years. Assembly was certainly time consuming but not overly difficult. I will say that you will need at least two people to assemble this hoop. There were probably 3-5 instances where I needed the extra help during assembly, so for the most part you can do it on your own, but some steps will be impossible without the extra hands. Some of these steps where extra help will be needed include when you fit the three support pole pieces to each other, attaching the backboard to the support braces, and when you install the screw jack lift system. I do not have an exact time frame for how long the Spalding Hybrid Portable Hoop takes to assemble because I did it over the course of two days. However, I’d say that if you are reasonably handy like me (certainly not exceptional) and don’t make some of the boneheaded mistakes I made, then you should be hooping in no more than four hours. Having gone through the assembly process with the Spalding Hybrid Portable Basketball System I have a few tips to use to make your assembly process as painless as possible. Make sure to read the directions for securing the bolts. On several assembly steps you do not want to tighten the bolts completely. My experience was that the glossary of bolts, nuts, and washers was not completely accurate in terms of both numbers of each item listed and pictures. Do your best to use the right bolts. It gets easier to identify the correct items as you go along. Side note: it appears that Spalding uses some generic pages in their manual which causes this issue. I’d like to see them create completely custom assembly manuals for each hoop model they sell. Now that I’ve gone over the good and bad points of the assembly process let’s get into the meat of this review. This includes how the Spalding Hybrid performs, both good and bad. I’ve used the hoop several times now and feel confident that I can offer anyone considering buying this hoop a good idea of what they will get with their purchase. Overall I’ve been impressed with the rim quality on the Spalding Hybrid Portable Basketball Hoop. 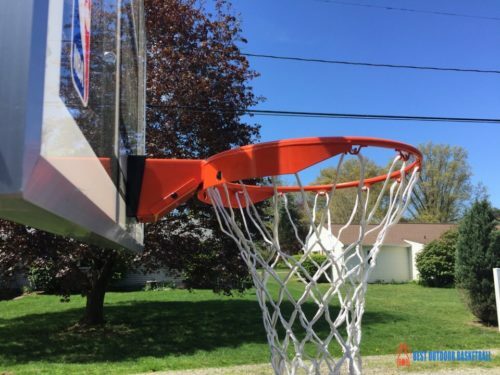 I will be the first to admit that the rim on this hoop is not up to par with a gym quality breakaway rim, but you should not expect this when spending $500-$700 on a hoop. If you do have this expectation then I suggest seriously considering a top of the line in-ground basketball hoop that generally start in the $1500 price range. When shooting the rim performs best on shots that hit the back of the rim, which makes sense because this is closer to where the rim connects to backboard. Shots that hit the front of the rim tend to make the rim perform in a more flimsy manner. Performance on shots as a whole has been slightly better than I expected. A common question I get is if the rim can handle dunking. I would not recommend hanging on this rim, especially from the front for fear of damaging the rim or potentially tipping the hoop. It can likely handle some dunking but it will probably shorten the life of your hoop if you dunk on it regularly. That being said the rim on the Spalding Hybrid impresses me when considering the cost. I certainly feel like it meets my needs and will meet the needs of most families. 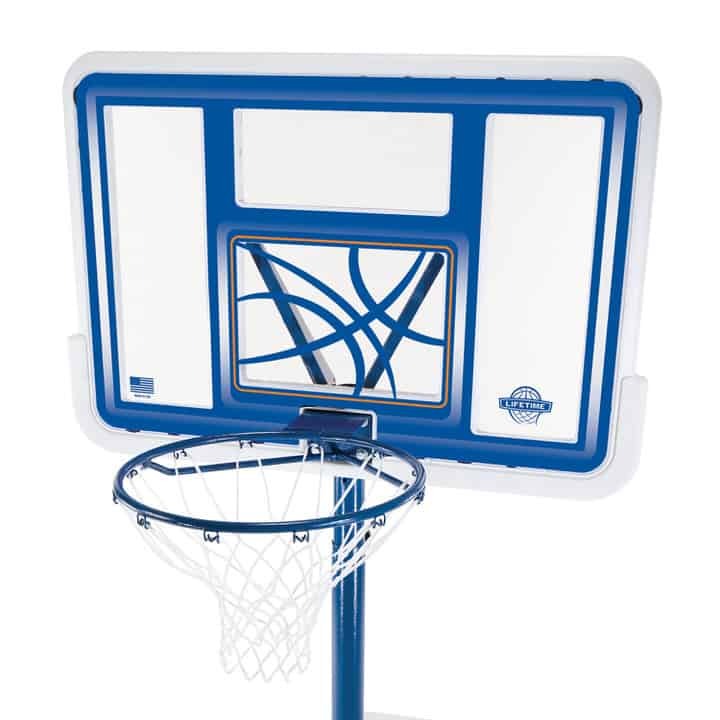 Spalding offers several different backboard models for the Spalding Hybrid Portable Basketball Hoop. These include 54 inch and 60 inch acrylic backboards which are good mid level backboards. On the expensive end there is a 54 inch tempered glass backboard version that will cost you a couple hundred dollars more. I picked up the cheapest option, the 54 inch acrylic backboard. I must say that the backboard has surpassed my expectations. The ball comes off the backboard with velocity, with bank shots and layups performing in a similar fashion to tempered glass backboards. The only thing I will say is that with a 54 inch backboard you don’t have as much room to operate when executing a reverse layup. 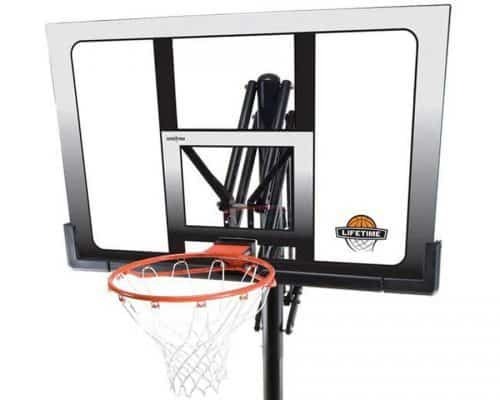 Sometimes the ball will hit the side of the backboard on the 54 inch version, when on a larger backboard the ball could very well end up in the hoop. However, this is a small price to pay. If you feel like that would bother you then consider moving up to the 60 inch acrylic backboard. With the quality of the acrylic backboard I don’t see it being worth the extra $200 for the 54 inch tempered glass version. Most fill bases found on portable basketball hoops are only filled with water. 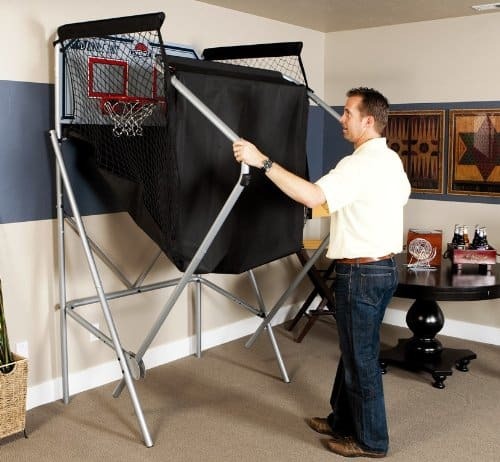 These can range in size from 25 gallons all the way up to 60 gallons for the Spalding Beast Portable Basketball Hoop. The Spalding Hybrid Portable Basketball System really changed the game in terms of the fill base. On the Spalding Hybrid you have two main compartments. The first compartment is the actual base and can be filled with up to 19 gallons of water. 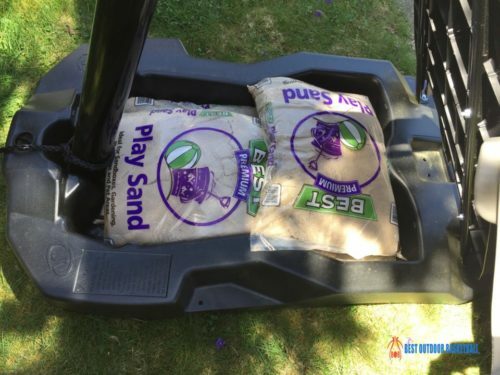 The second compartment is actually a space that has been “cut out” of the base so that you can put up to four 50 pound bags of play sand in the base. At first this didn’t seem like a big deal to me. But now I see the advantages. Most portable basketball hoops are hard to move when the base is full of water. This means you have to empty the base somewhat to be able to transport your hoop to another location. With the Spalding Hybrid Hoop you only need to remove the bags of sand and the hoop can be moved with the 19 gallons of water still in the base. Having this options makes the Spalding Hybrid more versatile than most other portable hoops. 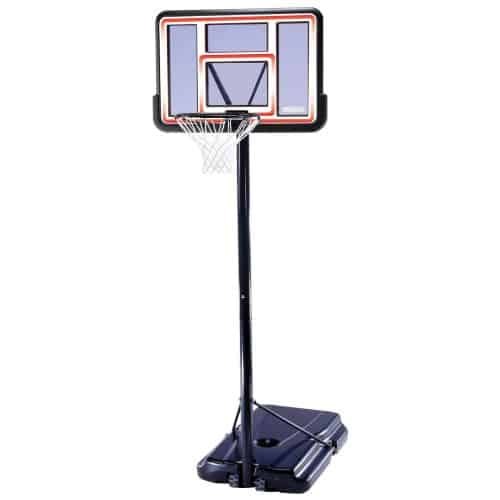 Featured on the Spalding Hybrid Portable Basketball Hoop is a three piece support pole. Three piece means that there are literally three pieces that are attached together to make the support pole system. 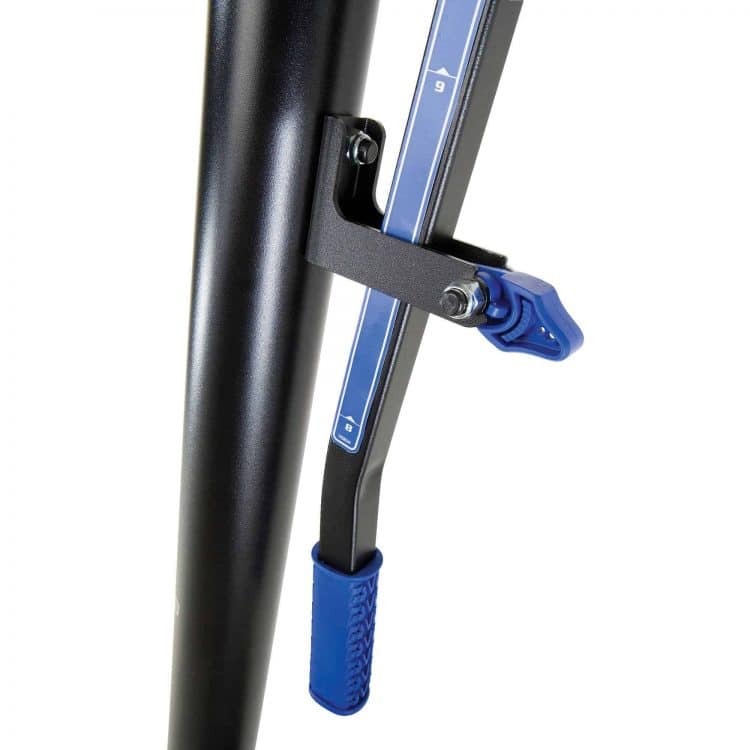 Three piece support poles are found on most portable basketball systems. 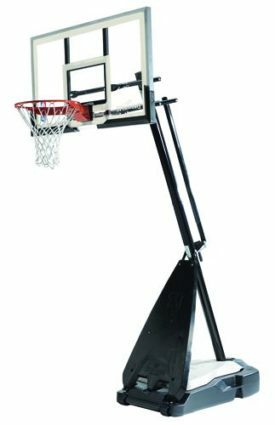 In fact, I believe the Spalding Beast is the only portable basketball system that has a two-piece support pole. For those who are wondering, one-piece support poles are the best, but they are only found on higher-end in-ground hoops. I must say that going into the purchase I thought that the three-piece support pole would be the cause of a lot of vibrations with the hoop. Thankfully I’ve found that my worries were unfounded. 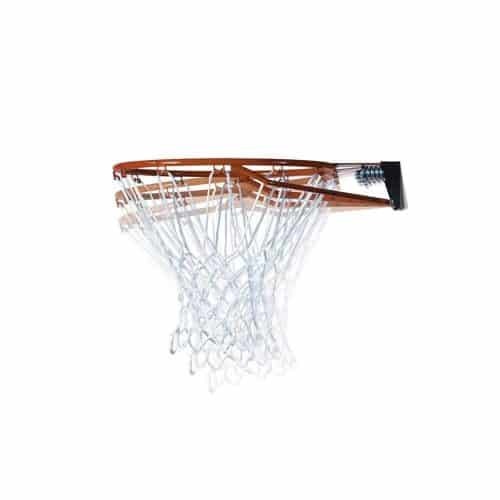 For having the cheapest support pole design the Spalding Hybrid is a durable basketball system. Hopefully this review has given you a thorough idea of what it is like to assemble and use the Spalding Hybrid Portable Basketball Hoop. I’m really glad I bought this hoop and I am satisfied with the performance. As I mentioned earlier, I would not spend the extra money for the tempered glass version. I just can’t imagine it making a big enough difference. Not only that but tempered glass is much more likely to break. If you feel that the Spalding Hybrid Portable Basketball Hoop would not be up to your expectations, but want a portable system, then I recommend the Spalding Beast Portable Basketball Hoop. With the holiday season coming up we felt it would be a good idea to give you some info on some of the best basketball related products that you can give as gifts to your young up and coming basketball fanatic. The Lifetime Double Shot Arcade Basketball System certainly fits into this category. For any of you who remember being a kid and setting high scores at your local arcade with an arcade basketball hoop, then you know how much fun these types of arcade basketball hoops can be. 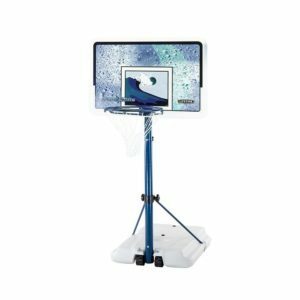 With the Double Shot, Lifetime has created one of the most durable, reliable, and all around high quality arcade basketball system designed for home use. One of the most important things for an arcade basketball hoop to do is to keep score accurately. If the system does not keep score accurately then it becomes a whole lot less fun to play. The Lifetime Double Shot Basketball Arcade System has one of the most advanced infrared scoring sensor system on any basketball arcade we’ve seen. Infrared is superior to systems with physical spring-loaded scoring sensors because the latter system cannot count two basketballs going through the hoop one right after the other. The Lifetime Double Shot also will fold up when not in use so that it does not take up as much space. This is a big bonus for those who do not have a large space for an arcade basketball system, but would still like one for their home. To fold the Double Shot simply lift the two front legs up at they bend and fold toward the rim and backboard. Durability and stability are also high on the priority list when it comes to arcade basketball systems. Lifetime Double Shot has you covered as this system features an 18 gauge powder-coated steel frame. This gives this basketball arcade system a strong “core” and minimizes shaking during gameplay. The rims and backboard of this arcade basketball hoop are higher quality than those found on most other systems. In fact, the Lifetime Double-Shot has the best rims we’ve seen on an arcade basketball hoop. As for things we don’t like about the Lifetime-Double Shot it pretty much comes down to the fact that this system does not use the power of the internet to allow you to play against players from around the world. While this is a newer technology, arcade basketball systems allowing you to connect to an App via bluetooth are starting to be available for sale. For example, the Shaq Cyber Hoop Shot being released at the end of October 2016. Having this technology on your arcade basketball system is huge because it opens up your playing opportunities beyond just family and friends. With this in mind, we hope that Lifetime decides to add a similar technology in the near future as it would certainly take the Double Shot to the next level. 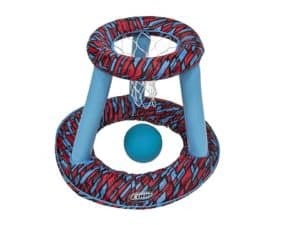 Lastly, this arcade basketball hoop comes with 7 mini basketballs and an air pump to get you on your way to playing some enjoyable games with your family. BestBasketballHoops.org is committed to reviewing basketball-related products and offer tips and advice for ballers of all ages and skill levels. In this article we are aiming to reach out to the parents with toddlers who are showing an interest in the game of basketball. Now that your little one is running around with a seemingly non-stop motor (where do they get the energy?) it is a great time to buy their first basketball hoop. But a regulation sized basketball hoop, even lowered, will be too large and toddlers will not have the strength to get the ball to the rim. Luckily, there are several really good toddler basketball hoops on the market today that offer a low enough rim and small enough system that are perfect for kids who are 2-5. We have picked four of the best toddler basketball hoops available to give you an inside scoop to see if one may be the perfect basketball addition to your child’s playroom. Little Tykes is a well-known toy brand specializing in recreational play-sets that can be used indoors and out. 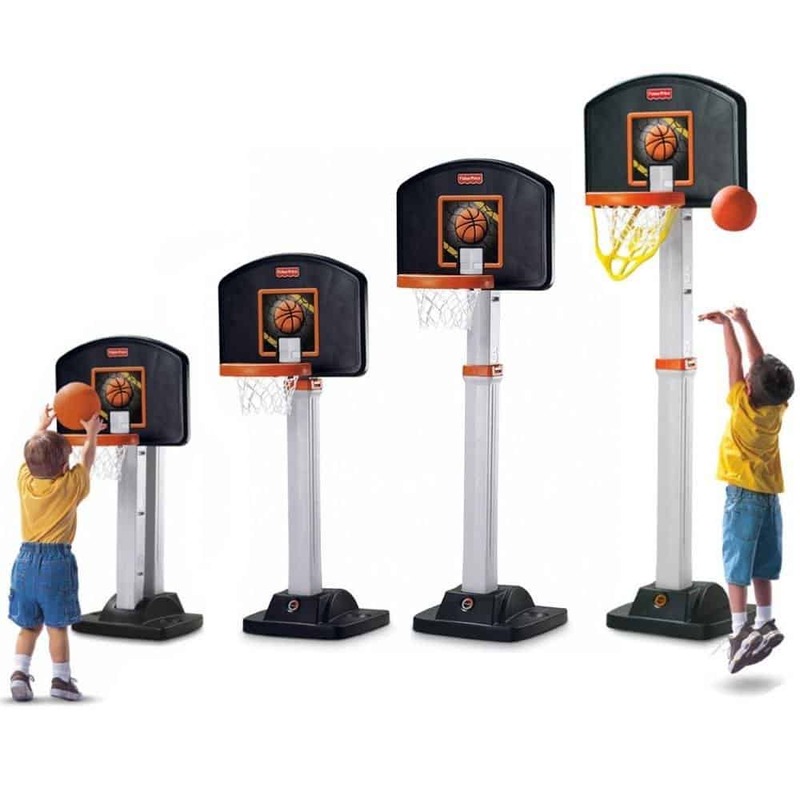 Their EasyScore is no exception as this toddler basketball hoop can be used in a rec room or outdoors on a driveway. 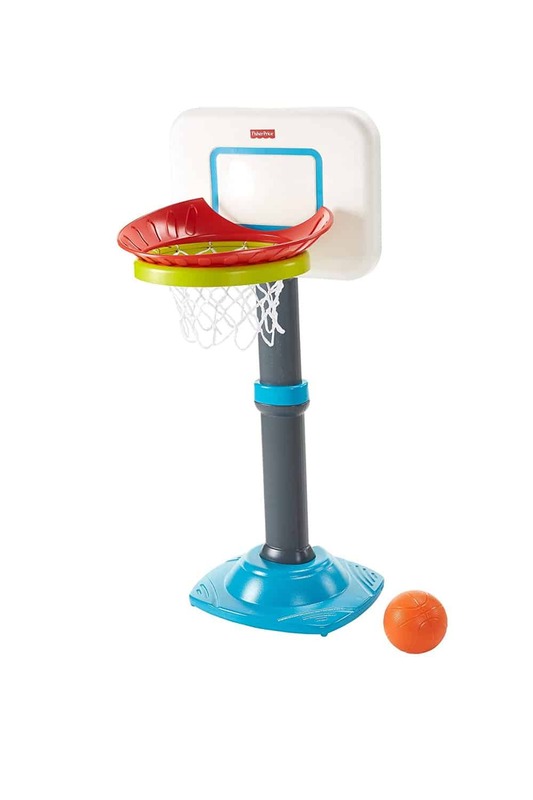 Little Tykes recommends this basketball set for kids aged 1.5 to 5 years of age. We agree with this recommendation as the hoop can be adjusted from 2 to 4 feet allowing this hoop to grow with your youngster. 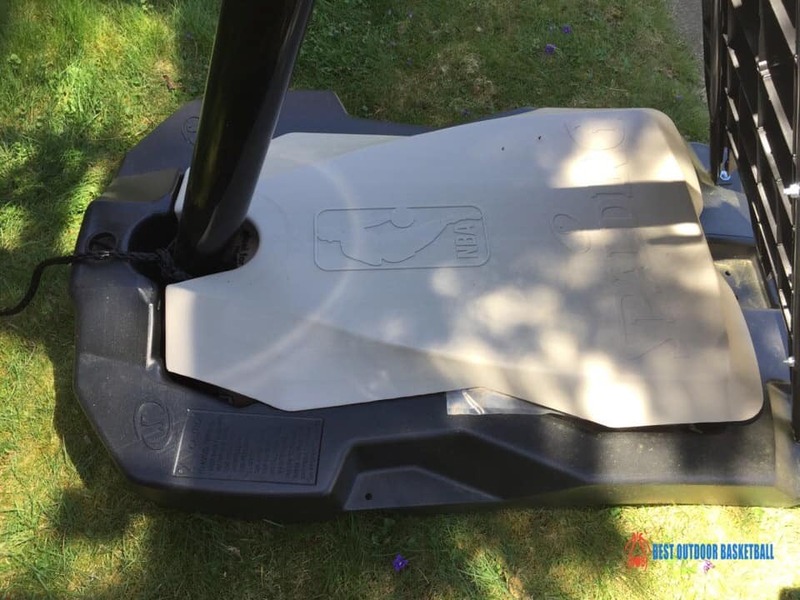 The base of the EasyScore can be filled with sand to help weigh it down to prevent tipping. This system weighs 10 pounds when not filled with sand, which makes it very easy to transport from room to room, or even for a big move. Dimension come in at 24″ x 22″ x 60″, which is not small but also not so big that it will take up a large space in a decent sized room. As for price, the Little Tykes EasyScore is very reasonably priced at around $30. While the Little Tykes EasyScore will work great for toddlers, once your child gets to be seven or eight years old they will have outgrown that system. 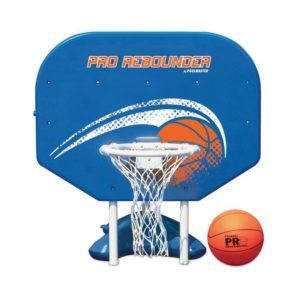 If you want a toddler basketball hoop that can grow with your child better then we suggest the Fisher-Price I Can Play Basketball Set. This basketball hoop is adjustable from 3 feet all the way up to 6 feet with 1 foot increments between. As you can see the I Can Play Basketball does not lower to the level of the EasyScore, but is able to raise a full two feet higher. Because of this the Fisher-Price I Can Play Basketball Hoop is recommended for ages 2 years and up. We also like the ball return that is included with this basketball hoop, which lessens the need to go run down the basketball after shots are taken. The base can be filled with either sand or water. 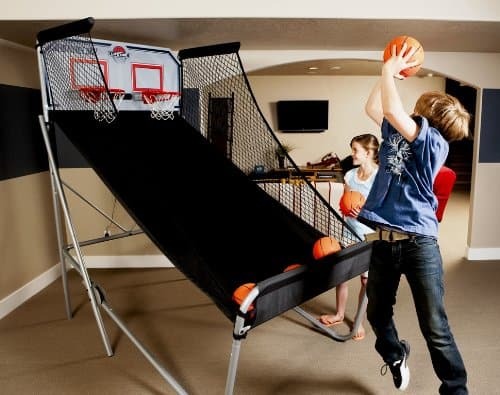 The Step2 Shootin’ Hoops Junior Basketball Set is another highly rated basketball hoop specifically made for toddlers. This system’s height can be adjusted from 30″ to 48″, which is less adjustability than the other hoops on our list. 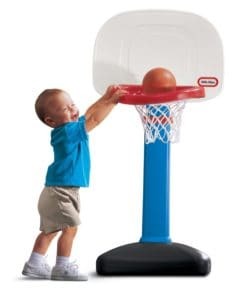 If you want a hoop that will grow with your child for a longer period of time we’d recommend the Fisher-Price I Can Play Basketball Hoop over this system. Despite the small adjustability range, the Step2 Shootin’ Hoops is well built and sturdy. The base can be filled with either sand or water. One of the more unique features of this hoop is that it has cup holders on the base, which we do not feel are that useful as bottles and cups are likely to get tipped over by a errant basketball flying through the air. Our last pick for best toddler basketball hoop is the Fisher-Price Grow to Pro Junior Basketball Hoop. This hoop’s height can be adjusted from 25″ to 40″ making it great for those in the 1.5 to 5 year age group. There are four height adjustment levels total. 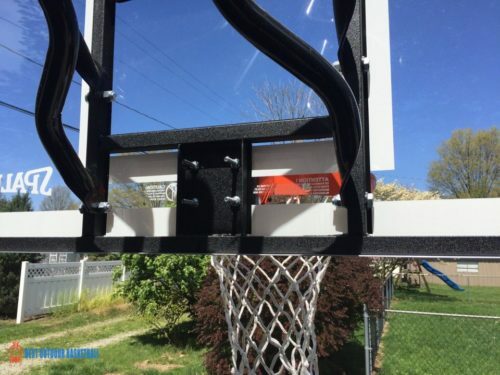 The most unique feature of this basketball hoop is that it comes with removable “Sure Score” rim that makes it easier for little ones to make buckets. However, we generally feel this is unnecessary as kids need to learn at a young age that missing shots is a part of the game. 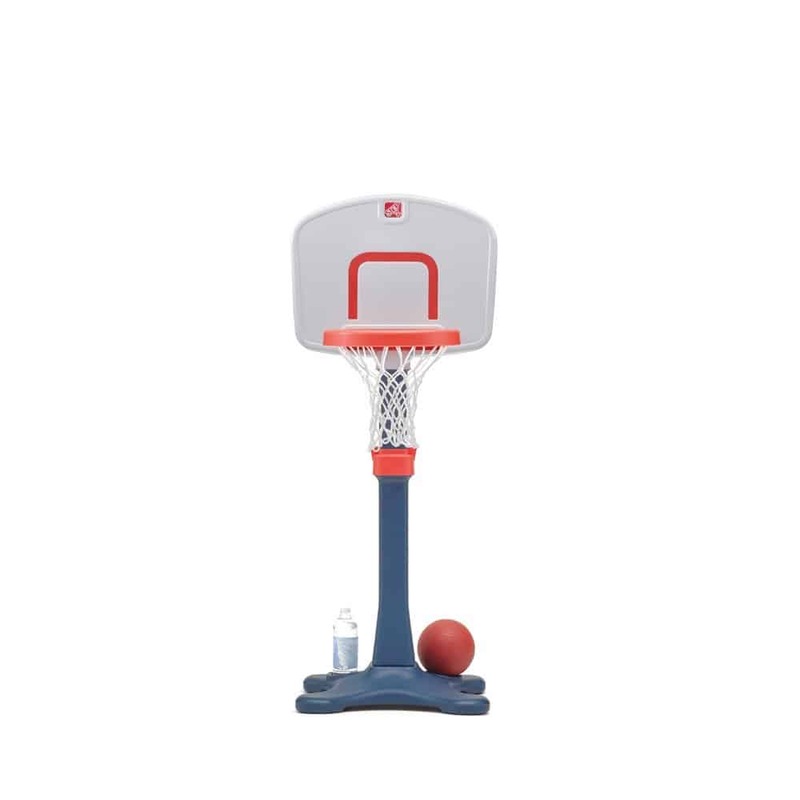 As with most of the other toddler basketball hoops on our list the Grow to Pro can be filled with either water or sand. 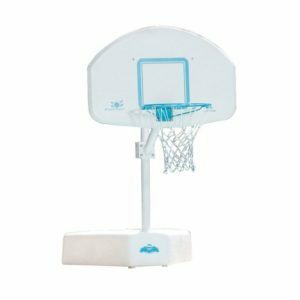 Whether for a birthday, Christmas, or just as a random gift, these toddler basketball hoops are a great addition to any playroom and will give your child hours of entertainment. Not only that but you’ll be introducing them to the great game of basketball! Simple Assembly: No tools required! We have reviewed many other low cost Lifetime Basketball Hoops in the past, and have found the vast majority of them to be a great value. These lower cost system generally cost in the $100-$400 range and are made primarily for families with children who want to learn the game of basketball. 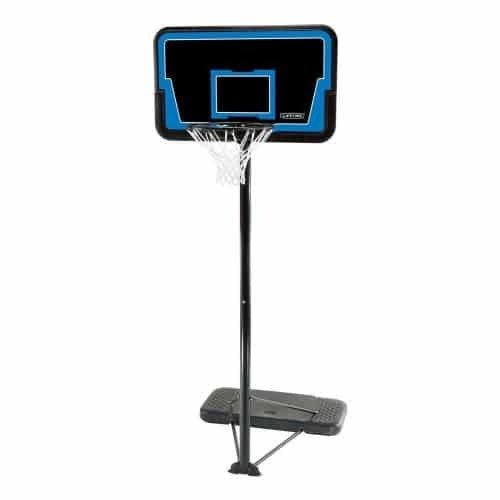 The Lifetime 1269 Pro Court Portable Basketball System is a hoop that finds itself in this category. 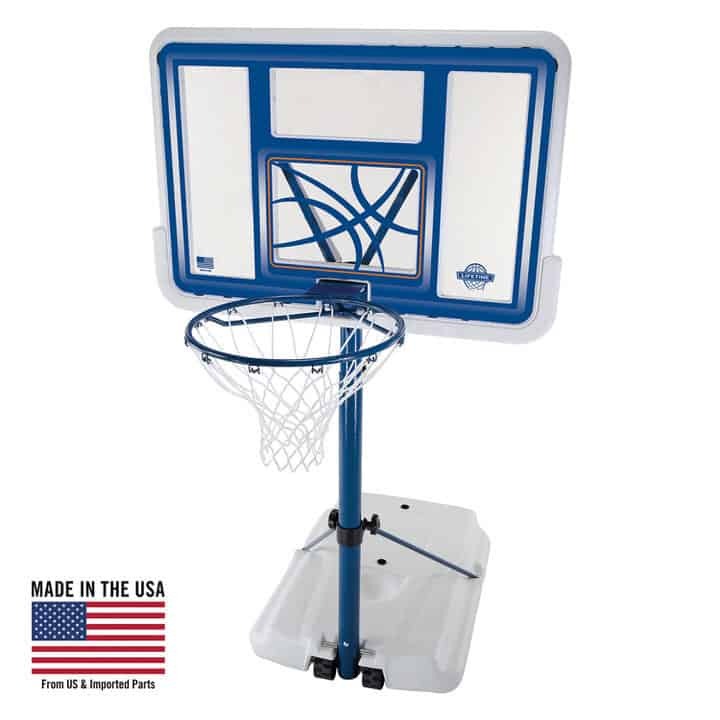 Priced at under $200, the Lifetime 1269 is one of the lowest cost portable hoops that you will find. If you are on a tight budget and don’t want to spend a ton of money on a basketball system, then give this hoop a closer look. To begin our review, we want to discuss the specific strengths of the Lifetime 1269 Pro Court. First, even we actually prefer a standard springless rim to the typical low grade double compression breakaway rims that are found on most low cost portable basketball hoops. Low quality breakaway rims tend to be too bouncy when shots hit the rim making them feel flimsy and unlike gym quality rims. Springless standard rims on the other hand are firmer and are more responsive to shots. 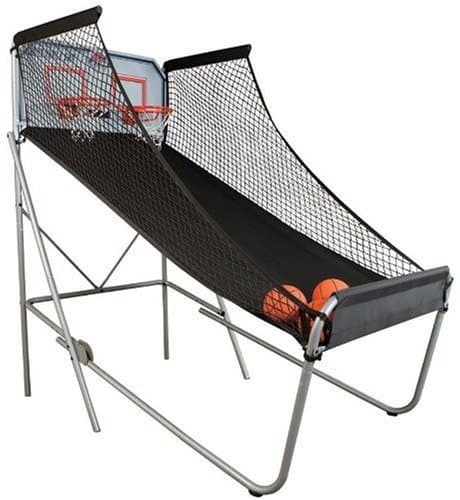 The truth is that low cost portable basketball system will not hold up to dunking over the long terms whether of not the hoop has a breakaway rim, so really what’s the point? We also like the relatively large 27 gallon base that is featured on the Lifetime 1269. Most portable hoops in this price range do not have this large of a base. For portable basketball systems, the base is a critical component. With a base that is too small you will find that your hoop could tip during inclement weather and during dunking. Bottom line, the bigger the base the more stable the hoop. The final strength of this hoop is simply price. At under $200, this portable basketball hoop is cheaper than all but a few hoops on the market today. If you are not going to spend over $500, the honest truth is that there is not a huge difference from a $200 to $400 other than a larger backboard and base. So, this hoop could give you just the amount of family fun for about half the cost. Now, with a hoop this low cost there are going to be some weaknesses. The backboard is small at 44 inches and is made from a type of polycarbonate material. Polycarbonate is the lowest quality backboard material and while durable does not perform well during play. This leads to a lack of responsiveness when the ball hits the backboard giving the backboard a “dead” feeling. The telescoping height adjustment mechanism is not the most user friendly. It requires that the person changing the height be able to support the upper half of the hoop while lowering it or raising it, making it impossible for most children to adjust the hoop height safely. 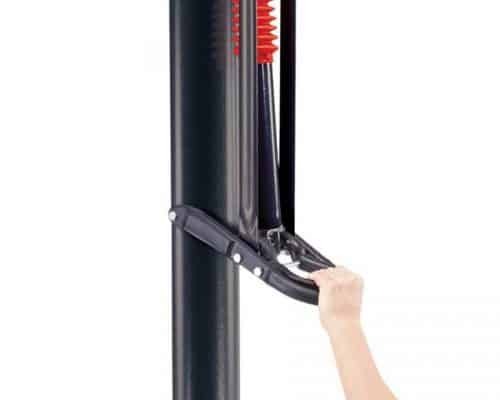 The three-piece support pole system is the lowest quality support system design found on basketball hoops. This lower grade support pole design means that the hoop will feel less stable during play. 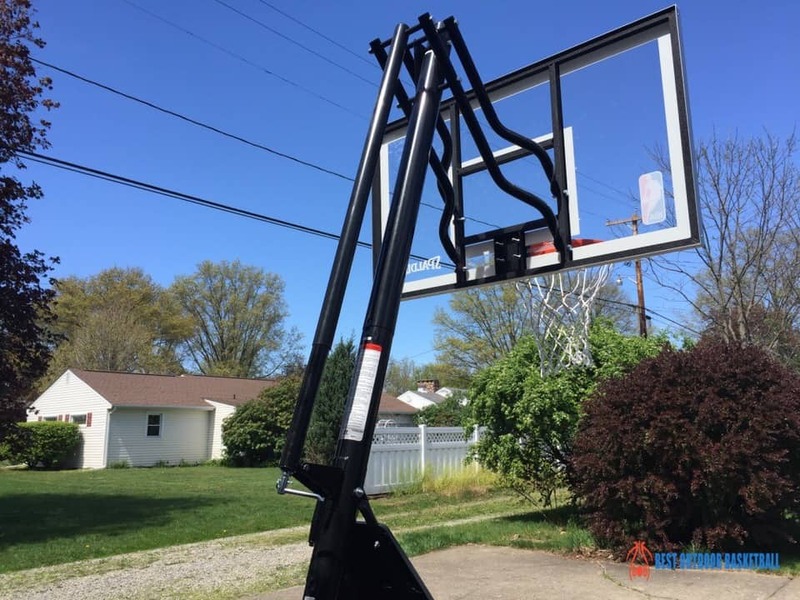 Lastly, the Lifetime 1269 Pro Court Portable Basketball Hoop does not have a support pole to hoop offset, which can make it easier to run into the support pole when driving to the hoop. A slightly more expensive Lifetime Basketball System that you may be interested in is the Lifetime 71286 XL Portable Basketball System. 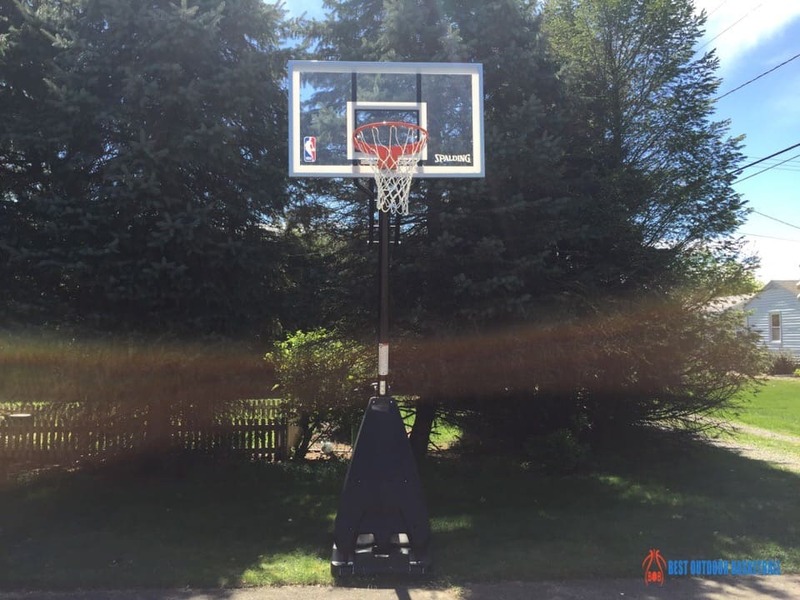 When shopping for a portable basketball system for your home, price is usually a factor that comes into play, along with quality, durability, and looks. If you don’t want to spend a lot of money, a great option for you is the Lifetime 1268 Streamline Impact Portable Basketball System. 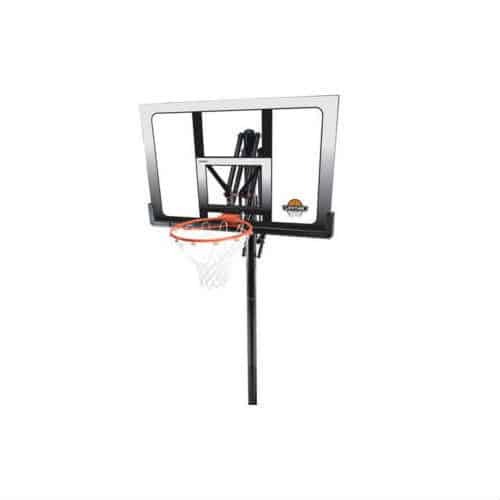 Solidly in the low priced category, the 1268 makes an average starter hoop for your family, and allows you hours of play and tons of shots without a load of money to spend. However, remember that paying a lower price can sometimes sacrifice quality and other features. Let’s take a look at some of the features included with the Lifetime 1268 Streamline Impact Portable Basketball system. While the price point is low, you might have to sacrifice some of the features and quality that you would find in other hoops. 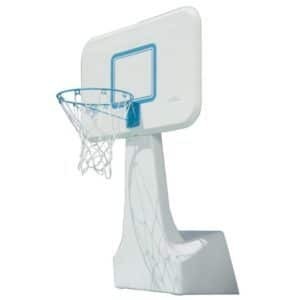 This hoop features a 44 inch backboard, which is constructed with a high-density polyethylene. While it is not the strength of an aluminum or Makrolon backboard, for the price this polyethylene can handle the job for most players with moderate use. The backboard has colored graphic details, and is UV protected for the color to last. Lifetime claims that the backboard can hold up through moderate use, and offers their 5 year warranty to back that claim up. The base of a portable basketball system is of great importance, as a good base allows the hoop to stay strong through high winds and weather, as well as tough games with minimal shaking. 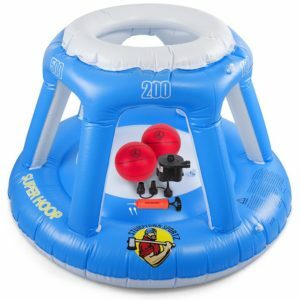 The Lifetime 1268 comes with a mere 12 gallon base which can be filled with sand or water; while this provides a lightweight and easily portable hoop, the weight of 12 gallons of water or sand cannot withstand vigorous play. Some mentioned it leaked water when filled, and others talked of the cheap, thin plastic of which it is constructed. 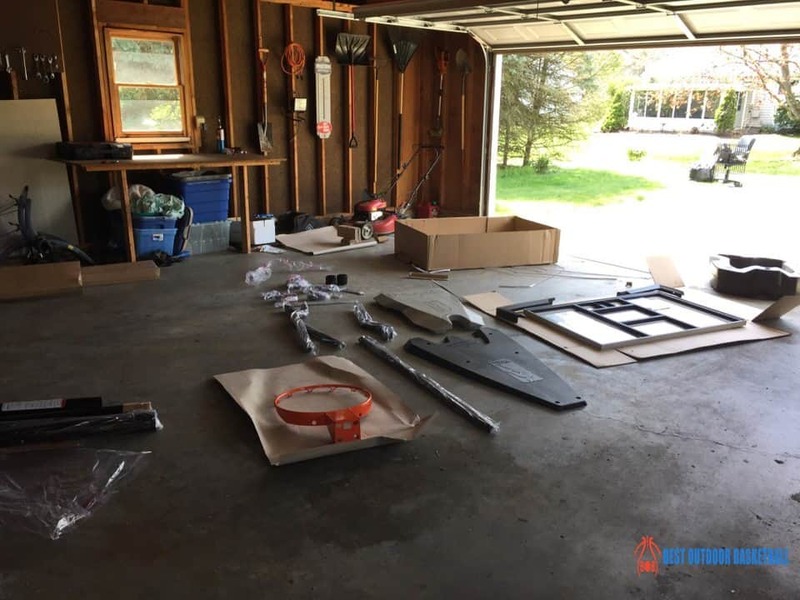 For the most part, assembly of the Lifetime 1268 Portable Basketball system can be difficult and too time consuming; multiple reviewers stated that they needed more than one person to successfully assemble this hoop, and that at times there were parts missing. Lifetime features helpful customer service if you come upon missing pieces or questions, and their 5 year limited warranty comes into play on many of the pieces and parts. A better starter hoop choice in our opinion is the Spalding Pro Slam Portable Basketball Hoop. It is more expensive, but still affordable and a much better hoop system.